An English Bulldog Rescue Network is the perfect place to adopt your next Bulldog. These rescue centers take in Bulldogs that are strays, who have been left with a veterinarian and sometimes they also come from other animal shelters. People should avoid "shopping" for Bulldogs from pet stores or getting them from puppy mills. Make sure adopting a Bulldog is something that will work for you for the long term. 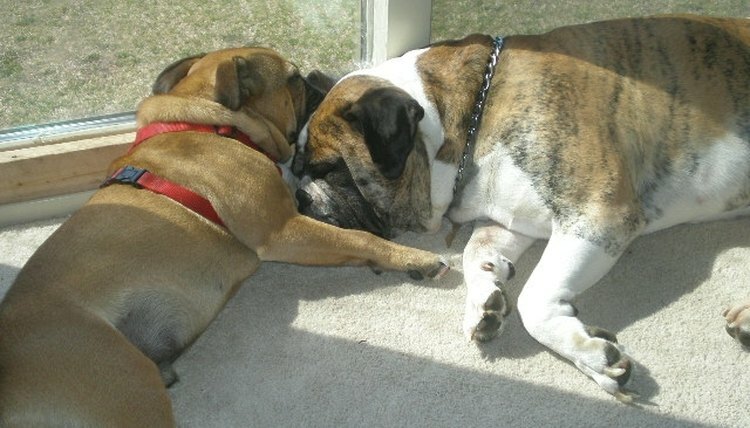 Be sure you have the finances to provide for the dog and also the time to spend with the Bulldog. They love attention. Find an English Bulldog Rescue Network. You can begin your search at Bulldog Club of America or English Bulldog Rescue and Adoption. These organizations can help you find bulldogs that are close to your location. Read the recommended materials. The Bulldog Club of America requires that you read their breed information page, along with their BCA contract. Fill out an application. Anyone looking to work with an English Bulldog Rescue will need to apply. The rescue centers will only place dogs into homes that they feel will work best for the dog. Fill out the application thoroughly and honestly. Contact one of the English Bulldog Rescue centers by phone or in person, speak with one of the volunteers and ask that they review your application. This shows that you are serious and makes sure your application has been received and will be looked at. Expect a wait time. Depending on how many Bulldogs are available in your area, there may be a wait time anywhere from a couple of weeks to 5 years. If you aren't able to adopt a Bulldog immediately, please do not go buy one from a pet store or puppy mill. Find a legitimate, reputable Bulldog breeder. The Bulldog rescue centers can help you locate them. Learn as much as you can about Bulldogs prior to an adoption so that you really can know what to expect. Know that most Bulldogs who are adopted from an English Bulldog Rescue will not be perfect. They may have emotional, health, trust or social issues.